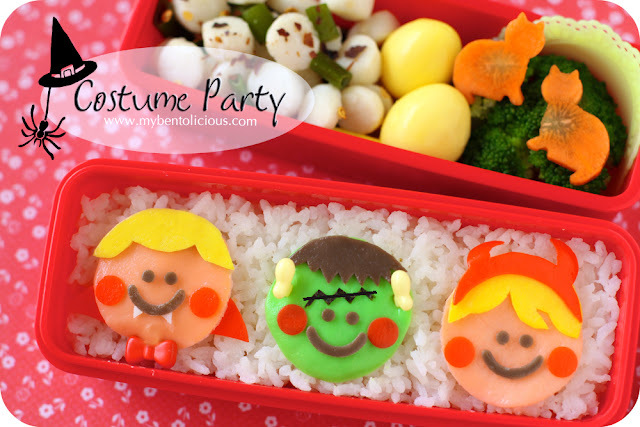 Kids' Halloween costume party idea is for today's bento. I made 1 vampire boy, 1 frankenstein boy, and 1 devilish girl. One more Halloween theme bento to go for tomorrow which I don't have any idea yet what to make for the last one. Next month my kids will start an extra math lesson (twice a week) called Sakamoto method. Basically they will be given some worksheets to do with story, then they will have to solve the problem. I love this method and I think both kids will get benefits from the extra math lesson especially Audrey who will sit in the national examination next year. School here are much more competitive now and every subject is getting harder every year. Andrew loves to do math worksheets so this will be fun for him as well. For me, I will have to do more jobs on driving and waiting hehehe ... :D Inside the box : rice, sauteed small scallops with lemon grass & ginger sauce, quail eggs, steamed broccoli, and cat shapes carrots. Due to the earthquake & tsunami in Mentawai and volcano eruption in Merapi, The Urban Mama (TUM) is arranging the donation that will distribute later to the victims in both areas. If you want to make a donation, please read more here. I love the costume party! What a great idea. I wish the schools here in the US were a little more competitive, our kids could use some extra math. Hope the kids will enjoy the "extra" math lessons, supposed to be fun right? This bento is adorable. It reminds me of vintage illustrations of kids books. I love it! Esp that little vampire with the 2 tiny teeth! Talk about details.. This is why asia is so far ahead of north america in terms of school and smarts. So much more focus on studying.. I think if you were to move here, your kids would end up in high school already. lol. They are way advanced. Have a super day Lia! ahhhh sooooo lovely cute costum bento concept ^^. how bout your migrant mba lia? @3snahousedesign : Migraine gone already, thanks for asking Esna! I really truly admire your creativity and patient to make these! Not only this one, but also other bentos you made are amazing! Super super super cute bento!!! Love it!! Love the little details Lia! You should design costumes for real :o) Good luck for the kids; it's hard when things get so competitive. Here too, the kids have to know more at an earlier age than when I was I school. Sigh. At least this class sounds fun and interesting! Oh wow, this is amazing! So colorful and kid-friendly. Did you use egg sheet for it all? How on earth do you get the colors so bright, that is fantastic!! You should post a tutorial!! I would be glued to it and following on your every word haha. Once again: GREAT job. I love your work! @Mokiko : Thanks a lot Mokiko! Brilliant idea, had so much fun examining all the cool details here, Lia! The carrot kitties and smiling party-goers are awesome in a cheerful bento full of lovely color! Sooo beautiful and love all the details. I agree with Sheri, you can design costumes for real. Chinese school here are much more competitive, kids have to attend few tuition classes most of the time. Pity them. oh, i love all of them..so colourful yet so well-balanced bento. you are really the master.. you should really publish your own bento book.. Happy Halloween to you and family and have a great weekend yeah! @Sysyl : Thanks a lot Sysyl!